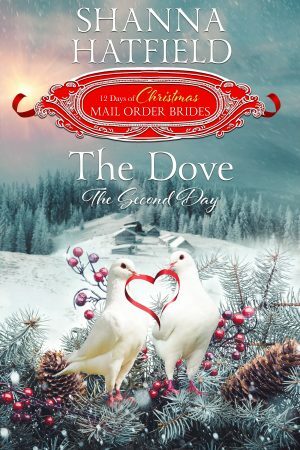 The Dove is book 2 in the 12 Days of Christmas Mail-Order Brides series. The Twelve Days of Christmas Mail-Order Brides, written by twelve bestselling authors, put a new twist on an old song in this heartwarming historical romance series with stories ranging from sweet to sensual. The Partridge by Kit Morgan – A clever man’s plan becomes a matchmaking disaster…and the countdown begins to save the town of Noelle. Releasing December 1. The Dove by Shanna Hatfield – A bewitching gypsy and a beguiled blacksmith tangle over a hidden treasure…with only eleven days left to save the town. Releasing December 2. The Hens by Merry Farmer – A wandering woman finds exactly who she was looking for, but not who she was expecting… with only ten days left to save the town. Releasing December 3. The Calling Birds by Jacqui Nelson – A wanted woman’s flight, a man in pursuit of honesty not stolen gold… and only nine days left to save the town. Releasing December 4. The Gold Ring by Caroline Lee – A dangerous masquerade and a twist of fate put Noelle’s future at risk…with only eight days left to save the town. Releasing December 5. The Goose by Peggy L. Henderson – A woman on the run, a man who doesn’t want to be caught—it’s one wild goose chase…with only seven days left to save the town. Releasing December 6. The Swan by Piper Huguley – A beautiful woman with secrets comes to Noelle to confront a powerful person with the truth…and only six days left to save the town. Releasing December 7. The Maid by Rachel Wesson – A convicted murderer, a young maid on the run…and five days left to save the town. Releasing December 8. – A desirous diner owner and a disguised dancer waltz their way to love… with only four days left to save the town. Releasing December 9. The Lord by Danica Favorite – An assayer and a ladies maid, each living a lie. Will the truth ruin everything…with only three days left to save the town. Releasing December 10. – A determined matchmaker, a stubborn mountain man…and only two days left to save the town! Releasing December 11. The Drum by E.E. Burke – A bad luck bride, an exploding disaster…can Noelle be saved in just one day? Releasing December 12. “You’re even more beautiful than I dreamed, Miss Mirga,” Culver said, shocked to discover his tongue joined the rebellion his heart and feet previously staged against his good sense.